Captain Kevin Nolan ensured Andy Carroll's presence was not missed as West Ham climbed out of the relegation zone. From the Hammers' perspective, the build-up to the trip to Villa Park was clearly overshadowed by attempts to save Carroll from a three-match ban following his clash with Chico Flores in last week's 2-0 win over Swansea. A three-man Football Association appeals body initially upheld the decision of referee Howard Webb. Infuriated, West Ham took the matter further, only for an arbitration panel to insist the suspension should stand. Facing three key matches against relegation rivals without Carroll's imposing presence, West Ham boss Sam Allardyce feared the worst. Against Aston Villa, he need not have worried, not given the club's abysmal home record this season, and in particular with the talismanic Nolan riding to his rescue. After scoring twice to defeat the Swans, Nolan made it four goals in two matches as another double was enough to sink hapless Villa. During the opening 45 minutes West Ham always appeared the side most likely to score, and once the interval was out of the way, they did so after just 15 seconds. When Nolan added his and the Hammers' second just two minutes and 43 seconds later, the game was effectively over. In Villa's last home match they had come from 2-0 down inside nine minutes to defeat local rivals West Brom 4-3, but looking bereft of ideas on this occasion there was simply no way back. Certainly, it was too much for the home fans to expect another feast of football, especially when you consider, the West Brom game aside, Villa have mustered a miserable eight goals in their other 12 league home games. Instead, it was the visitors who were the more enterprising as Villa failed again to sparkle in front of their own supporters and provide them with some warmth on a bitter and windy afternoon. All bar one of the better chances in the opening 45 minutes fell the way of West Ham, the best of which involved Matt Jarvis. It was his third-minute corner that was glanced wide by James Tomkins before two chances followed just before the half-hour mark. The first saw Jarvis strike one shot into the side-netting, although Ciaran Clark deserved credit for getting a foot in that helped it on its way. The second saw Jarvis seemingly clean through, but this time Nathan Baker nipped at his heels, resulting in the attacker's effort ending up inches wide. As for Villa, their first-half highlight involved Ashley Westwood firing in a 16-yard volley that flashed just beyond the right-hand post. Following the break Nolan then took centre stage, initially after 15 seconds, albeit courtesy of Stewart Downing's industry as he turned Ryan Bertrand inside out before delivering a low ball into the heart of the area. Nolan, though, was still artful enough to produce a cheeky flick with the inside of his right foot that took a deflection off Clark, wrong-footing Brad Guzan. For the second goal all the hard work was from Nolan as he robbed a dithering Fabian Delph just outside the area before taking the ball on into the box and stroking it crisply past Guzan. 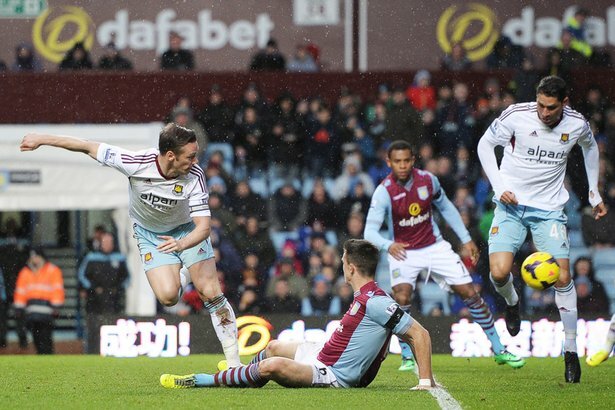 Two goals down, Villa finally woke up, instigated by the 56th-minute arrival of Marc Albrighton for Matt Lowton. With his first touch, a delightful cross in towards Christian Benteke, the Belgian striker was inches away from steering it home. Albrighton then rattled a post from 25 yards with a thunderous strike that clipped the flying Adrian's right leg on the rebound. On another day it might have ricocheted in, but this time it flew over the net. Benteke then hit the crossbar with a header, conjured an overhead kick that flashed over and produced another header that was wide, but it was all too little too late for Villa as Carroll-less West Ham were left singing all the way back to London.